These six pages were captured from an S-VHS tape recorded on 9 November 1991. CEEFAX reported the death of Freddie Mercury in 1991. This plain design allowed maximum space for the news story, 17 lines in all. Despite the widespread use of sub pages on CEEFAX, the news section has generally kept to single frame pages. What was on BBC 1 on Monday 25th November 1991, with an extra programme added to the schedule as a tribute to Freddie Mercury. The News was not divided into Home and World sections, and there was still an indication of the Latest Story. This style of news page dates from 1993 - the additional graphics characters are a dreadful waste of space. For a while in 1993 there were one or two regional headers about. Does anyone know any more about this or have any other examples? ... followed by a Weather Index page from 1994. 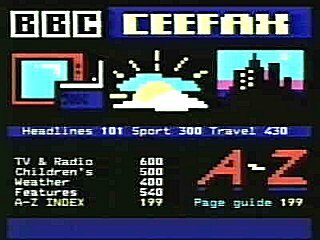 Note the space in the header row between CEEFAX and 100. The network identifier was not present in the first week or two of the launch and it may have been letters sent at the time by Darren Meldrum and myself which helped introduce it. A couple of weeks or so later the network identifier is now in place. As you can see, these four CEEFAX In Vision frames come from 1997. A news page in the current style from July 1998. 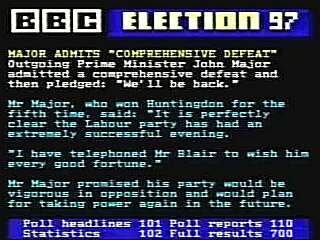 CEEFAX put itself in the news on 01-Jan-1999. You can read more about the early days of CEEFAX in the The Teletext Museum Features section. I can't come to terms with traditional teletext being described as an "analogue teletext system". Although it is broadcast alongside analogue pictures the text is of course transmitted as digital data. CEEFAX were in trouble again on 06-Jan-1999. It was rare to see the entire service disappear in this way. ... and then later (the following morning) BBC1 closed down for some engineering tests! ... and passes, the Millennium bug having caused almost no impact at all. The 'new' BBC Text service, which had been available to viewers of DTT transmissions since October 1999 finally became available to viewers of the Astra Digital services in March 2001. 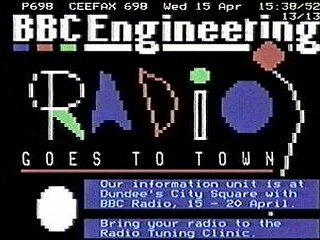 Finally, as a special treat, we present "The CEEFAX Engineering Test Page", the animated special edition!